True confession: I’ve never sold anything I’ve made. I hope that still isn’t true after the upcoming Dear Santa show at Sage Farm. I’ve got a small collection of Christmas wreaths about to make their public debut. 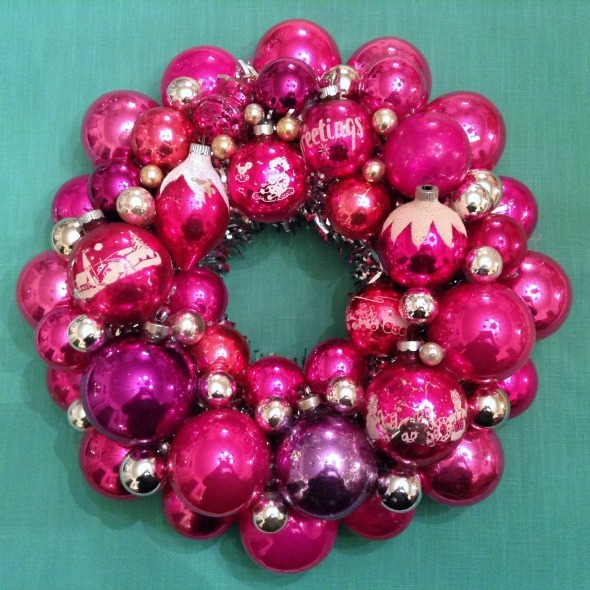 If you’re looking for something out of the ordinary, this magenta and silver vintage ornament wreath might just be it. Not impressed? Well then how about this one? What a great display! Everything pops against that green door. Yes, yes, I KNOW it’s not even Thanksgiving yet. 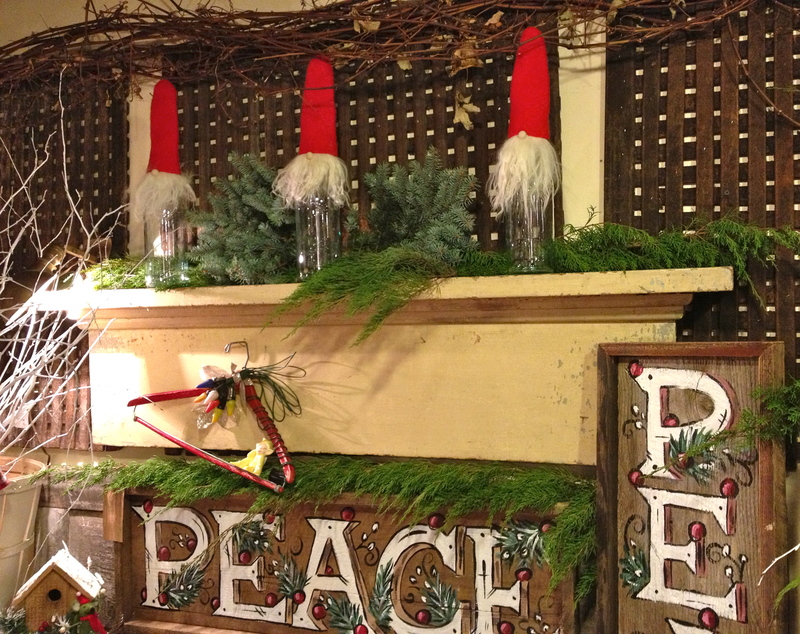 But at November’s Sage Farm show, there were a few corners that looked a lot like Christmas. I snapped some photos of red & green. Take a look! 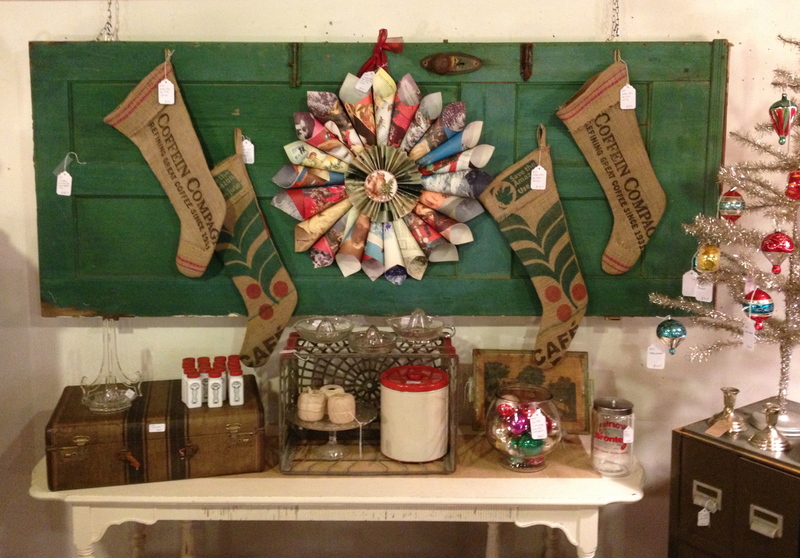 Part of the fun of going to Sage Farm is seeing how the best dealers merchandise their stuff. I always try to look at that. It’s a free education if you pay attention! But a few smalls always catch my eye, too. Here are six of them from last weekend’s Sage Farm show. First, a McCoy iris vase displayed with other pottery. I don’t care that it’s McCoy, I just love the flutey shape, and the yellow. Because yellow is a happy color. 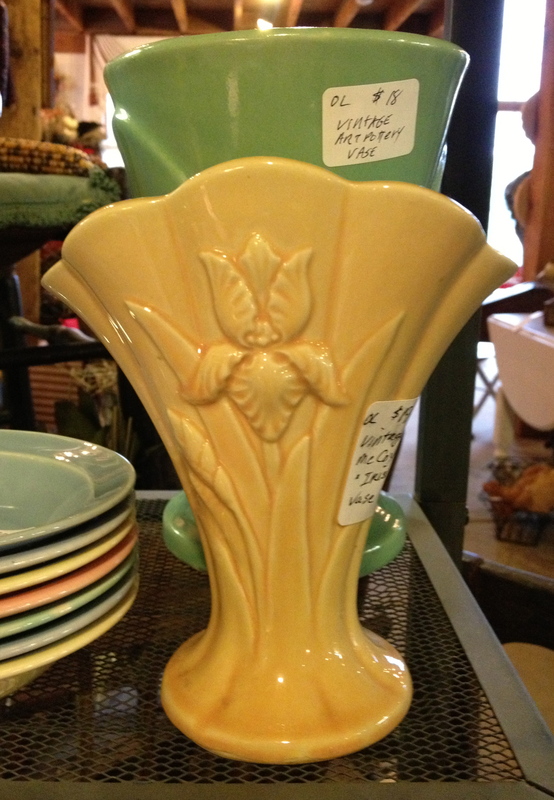 (A vase identical to the green one behind the yellow McCoy is sitting on my mantel right now!) An almost-rusty steel window screen displays vintage postcards. 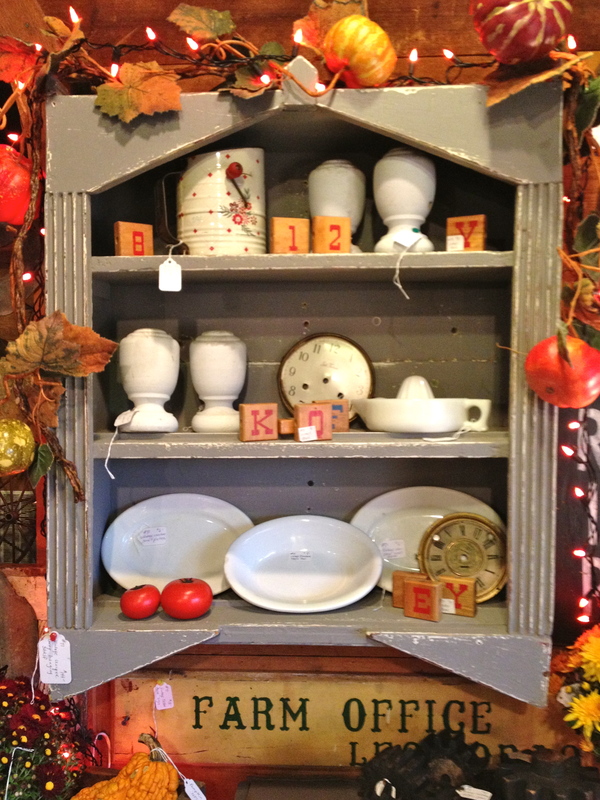 Wouldn’t this be great in your kitchen for recipes and notes? Too bad rust isn’t my thing. Now if I found a white enameled steel version . . .
See the other goodies I found! Last weekend’s “Of Autumns Past” show at Sage Farm was all-out beautiful. 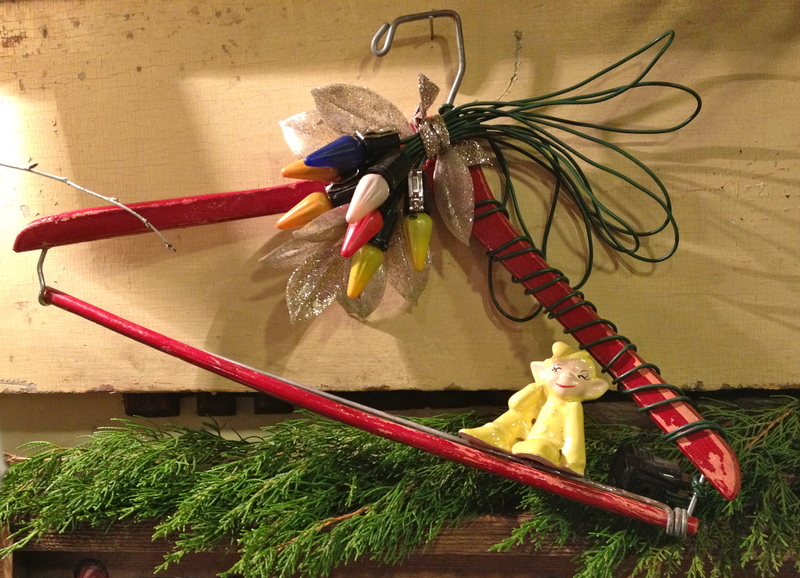 Lots of natural wood, harvest colors, and sparkling lights. Here are a few of my favorite things. Curves & color & BIG PRESENCE—this green rush-seated bench has it all. Somebody else thought so, too, and snapped it up on the first day of the show. 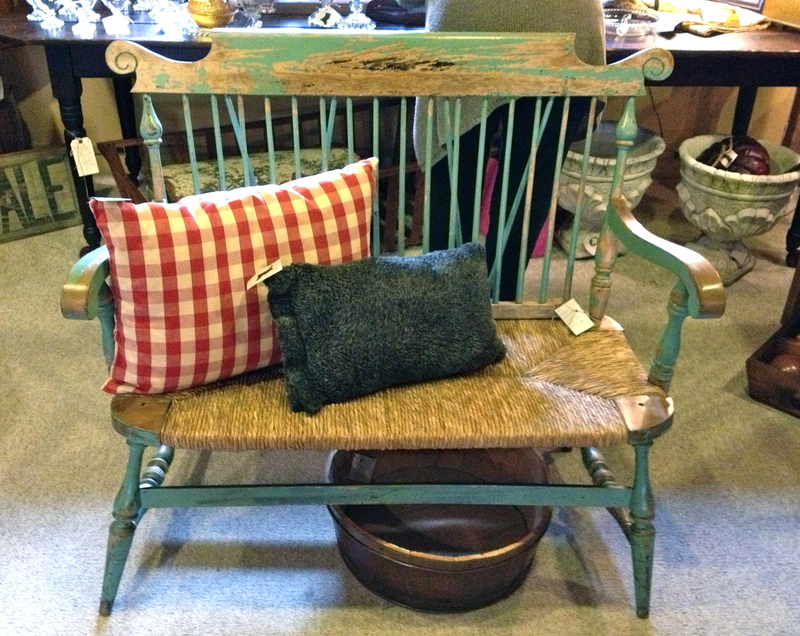 I loved this shapely green bench! The dealer said he’d got it from the elderly original owners. It was Hitchcock or Hitchcock-style when it was new, and after the black paint wore off they painted it green, and after the green wore off it they didn’t do a thing more. Genius.